New Mexico marijuana program a guide for Mass. J. Chris Romero, director of operations at Albuquerque’s R. Greenleaf Organics, inspected bud development. ALBUQUERQUE — In the first five minutes of talking to Willie Ford, president of R. Greenleaf Organics in Albuquerque, he makes the following distinctions: He sells medical cannabis (not marijuana), harvests from a farm (not growhouse), and provides medicine (not weed) at his clinic (not dispensary) to patients (not potheads). That careful choice of words reflects the approach Ford takes with every facet of his nonprofit medical marijuana business. R. Greenleaf and the state’s other licensed cannabis producers operate discreetly in unassuming complexes with small display signs — or none at all — and obsessive security, where they track their legal marijuana from seed to sale. Industry watchers say New Mexico, with one of the country’s strictest medical marijuana programs, provides a model for Massachusetts, where a ballot measure approved in November calls for up to 35 medical marijuana treatment centers statewide by the end of the year. Massachusetts, like New Mexico, will require these nonprofit treatment centers to oversee every stage — from the growhouses where marijuana is cultivated to the sites where it is sold to patients. 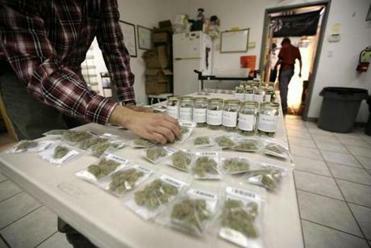 The Massachusetts Department of Public Health, which is charged with regulating medical marijuana, is supposed to issue detailed rules by May. Since New Mexico lawmakers approved a medical cannabis program in 2007, the state has enrolled more than 11,000 people who can possess up to 6 ounces with a doctor’s recommendation. Although New Mexico allows more conditions to qualify for marijuana treatment — such as post-traumatic stress disorder — Massachusetts is expected to have many more patients because of its larger population, and language in the law that lets doctors use discretion in deciding who might benefit from treatment. New Mexico’s department of health enforces limits on plant count (150), producer licenses (23), and qualifying medical conditions for patients (17). Producers have to price marijuana by the gram. No discounts are allowed for larger quantities — a rule intended to reduce chances of it being resold illegally. The average patient is 49 years old and spends $143 a month for 11 grams — roughly the equivalent of 22 large joints. The cost is not covered by insurance. At R. Greenleaf, patients have to show state-mandated blue registration cards when they enter the small clinic, which is on the second floor of a strip mall building. Newcomers receive a consultation to understand how cannabis works, discuss symptoms and dosage, and learn the different ingestion options, including edibles (such as cookies) and vaporizers (smokeless inhalation devices). Unlike some dispensaries in California and Colorado that have developed a reputation for lax standards, R. Greenleaf emphasizes professionalism: The drugs are kept hidden — not displayed in large jars like candy. There is no menu advertising different strains, with names such as Sour Diesel and Hash Queen, as seen in some other venues. Instead, the center packages its products in white paper bags marked with the company’s logo, like a pharmacy. But marijuana operations are far from traditional business ventures. Employees must pass a background check and security cameras are everywhere at clinics and offsite growhouses, where 1,000-watt high pressure sodium bulbs easily run monthly electricity bills to more than $3,500. There are unique financial complications, too. Although medical marijuana is legal in New Mexico and 17 other states, the federal government still classifies it as a Schedule 1 drug, meaning it has no medical value and is likely to be abused. That long shadow of federal disapproval has caused banks and credit card processors in New Mexico to shun marijuana businesses. They have reason to worry; some state-legal dispensaries in California and Colorado have been shut down by federal officials. J. Chris Romero inspected medicine inventory at R. Greenleaf Organics. Patients have to show blue registration cards when they enter the small clinic. To keep the Drug Enforcement Administration and other officials at bay, New Mexico’s program keeps a low profile. Names and addresses of producers are not made public; only patients are provided the list. Initially, patient records were even stored in a locked file cabinet in an obscure location only known by a handful of state workers, according to Steve Jenison, who worked as medical director for the New Mexico cannabis program from 2007 through 2010 and now serves on the medical cannabis advisory board. In keeping with that cautious — some might say excessively cautious — approach, there is no sign outside the Sacred Garden compassionate care center in Santa Fe, which is run out of a stucco complex alongside a hair salon, design studio, and social worker’s office. The waiting room aims for a zen-like aesthetic, with pale sage-green walls, espresso-colored wood floors, a black leather couch, and fountain sculpture. But the pungent smell makes it clear this place is something else. Behind the counter, employees open sliding drawers to pull out buds kept in small glass containers. They hand over “cannafudge” and marijuana-infused Rice Krispie treats from a minifridge, and instruct patients on how to use a hash oil pipe. The floor of the back room, which is accessed by passing through three locked doors, is reinforced to support a 2,000-pound safe. It’s where director Zeke Shortes uses special software to securely track patient records and sales data. Unable to get a business loan, Shortes invested $400,000 of his own money to open his center and convert a woodworking shop into a cannabis growhouse. The building, off a dirt road in a residential neighborhood, has plywood boards separating “bloom rooms” and rows of intense lights dangling from the ceiling. Another cannabis producer, New MexiCann Natural Medicine in Santa Fe, also could not find a bank willing to stake it a loan. So Susan Goodman, along with her husband Len, put in $150,000 of the family’s money, took out a home equity line, and charged up credit cards to support their three-year-old start-up. They also hired their children, including 24-year-old Adelyn, who graduated from Boston College in 2011 with a degree in biochemistry. In all, about a dozen people work at New MexiCann. Most make between $15 and $30 an hour, but a few salaried employees earn more. A psychiatrist and nurse practitioner visit once a month to help new patients fill out applications or existing patients renew their blue cards. Last year, New Mexico collected more than $500,000 in sales tax from $7.5 million worth of marijuana sold, according to the quarterly reports producers are required to submit. And for the first time, the state received $500,000 in licensing fees from producers, money being used to fund full-time positions to oversee the initiative. Patients have to reapply for the cannabis cards annually — a requirement New Mexico officials say Massachusetts should also implement. Even though more than 11,000 patients have been approved, only 8,200 are currently active, according to state records. Applicants must receive a recommendation from a doctor with the proper certifications, such an ophthalmologist for glaucoma, and all records are reviewed by the state. 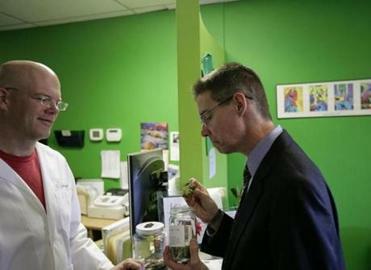 But it isn’t always easy to find a doctor willing to recommend medical marijuana. Joel White, 50, who was diagnosed with multiple sclerosis in 1989, said his primary care physician thought it was a good strategy after he developed a tolerance to prescription drugs such the sedative temazepam. But the doctor’s medical practice would not permit it. White had to drive 150 miles from Albuquerque to a small town in southern New Mexico where another doctor agreed to sign his papers. White’s daily marijuana regimen includes using a vaporizer and eating a piece of cannabis-infused fudge in the evening. The drug reduces his leg discomfort and makes it easier for him to stay asleep. White is a customer of R. Greenleaf and New MexiCann, but also grows a small supply of his own at home with a personal production license. Massachusetts also will permit people to grow marijuana at home if their access to a treatment center is limited by financial hardship, a physical inability to find reasonable transportation, or distance. Some patients in New Mexico have applied for home-growing licenses because of concerns over access — many producers say they regularly run out of inventory — and because it is less expensive. Staff at R. Greenleaf and Sacred Garden said they are often unable to meet demand because of supply limits. They said patient count has soared statewide while the number of producers remains static. New Mexico officials said that while producers have complained about running out of marijuana, they have received only occasional comments about such shortages from patients. “While our goal is to meet the need of patients, you can’t dismiss the fact that the producers’ goal is to increase profits,” said Andrea Sundberg, medical cannabis program coordinator. 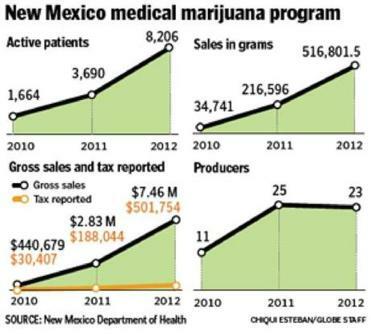 The program is constantly evolving — the initial plant count limit was 99, not 150 — and additional medical conditions have been approved in recent years, according to Ken Groggel, New Mexico’s medical cannabis program manager. The state is working to boost education and outreach for patients and doctors and to make testing marijuana for contaminants and THC, the active ingredient, a standard practice.